This is the lighthouse at Point Atkinson. One of my morning routines on the boat is to listen to the weather report. In Canada, they always report the weather at Point Atkinson to indicate what is happening in English Bay. It was cool to finally see it since that meant I was close to Vancouver. Coming into Vancouver by boat is gorgeous. The city sits at the base of the hills and there is green everywhere. I chose to dock in False Creek at Granville Island, just south of the city. Karen drove up to spend the weekend with me and Granville was the perfect spot. 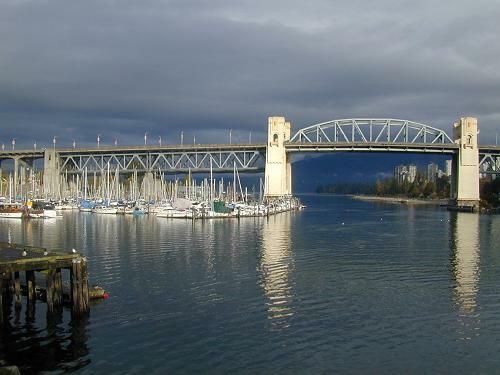 This is the Burrard Bridge from Granville Island. You pass under it when you enter False Creek. Karen and I spent most of the weekend on Granville Island. There are shops, art galleries, and several restaurants and pubs. What else could we want? In an outdoor clothing store I bought foul weather boots and a warm sweater. There was also a great chandlery just off the island. We did eat one dinner in Yorktown (the new hip area). After Karen left, I provisioned for the next part of my trip in the Granville Market. 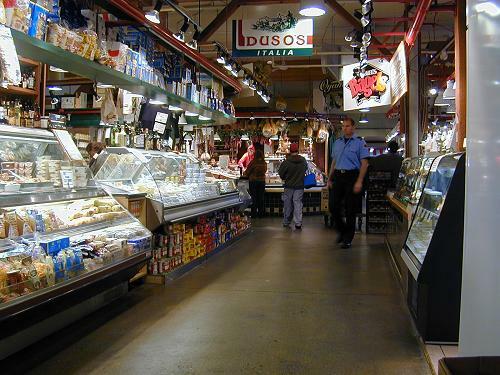 It's like the Pike Place Market but it's mostly food. 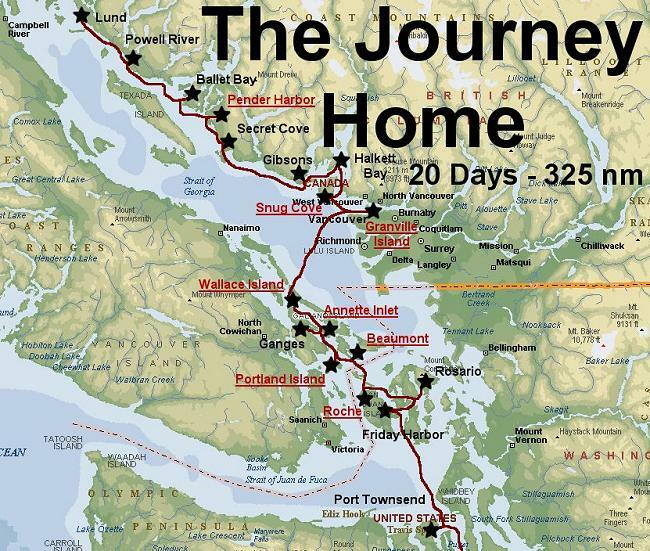 I crossed back to the Gulf Islands across the Strait of Georgia on a beautiful sunny day. I had good winds for most of the trip and only had to motor near the end to make it through Portlier Pass with the tide. I returned to Wallace Island to spend the night. Unlike when Craig and I were here 6 weeks previous, it was mostly empty. After 13 hours of sailing I dropped the anchor, made dinner, and went to bed early. This was the view the next day. On Wallace Island there are some old cabins. In one of the cabins there is a book exchange and some picnic tables. 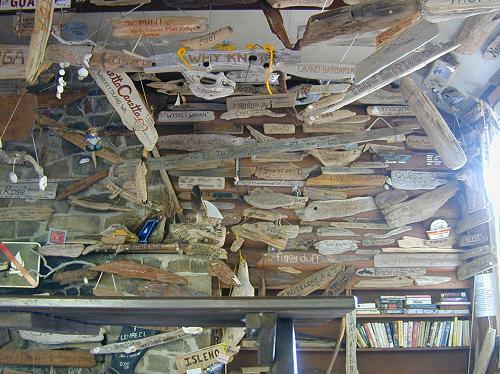 At some point, people started leaving pieces of driftwood with their boat names written on them. As you can see, this has been going on for quite a while. It was fun to see what people had written. Somewhere in this photo is a plaque for Gata Luna. The fall storm season means wave after wave of cold fronts that move through the region leaving clear weather in their wake until the next front a few days later. I would be lucky to align these clear periods with times when I either had major bodies of water to cross, or I had other people on board. When the bad weather moves through, you just slog through it. As you can see, I have very good rain gear, and plenty of safety gear as well. Here you can see my lifejacket/safety harness that I clip to a jack-line when I am single-handing the boat. I also wear my cell phone in a waterproof pouch. After the rain comes the sun. The air always seems so crystal clear on mornings after the storms. When I get a heavy dew on the boat I use it to wash the boat by wiping it off along with the salt and grime with a cloth. 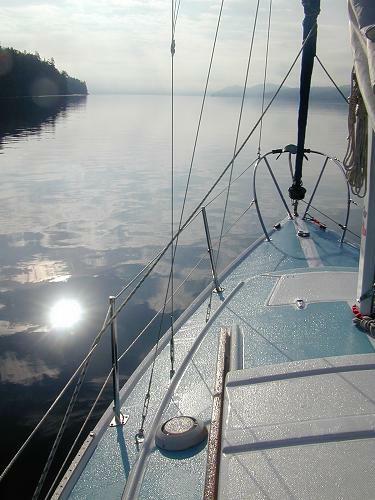 On this day it started out calm but the wind built to 15 knots in the afternoon. 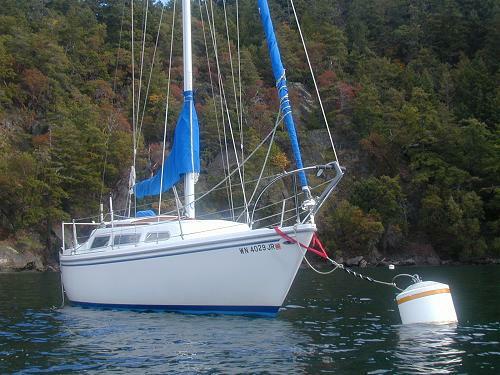 Perfect for sailing. This is the view from the top of Mount Daniel above Beaumont Marine Park. I always like to anchor in places where I have access to hiking. 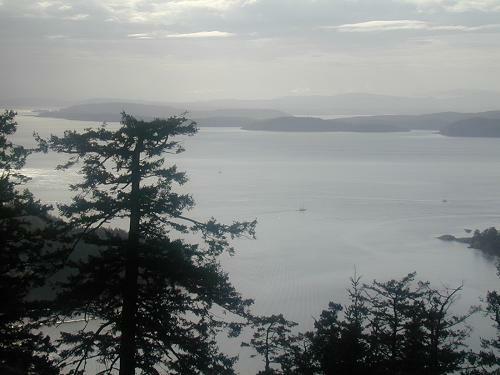 This is the view looking south across Haro Strait to Mortby Island and the Sydney area. In some of the Marine Parks there are mooring buoys you can attach to for the night instead of anchoring. In Canada, during the summer, they are $10 per night but after October they are free. I like to attach to the buoys when I know there is a blow coming. That way I don't worry about my anchor dragging. 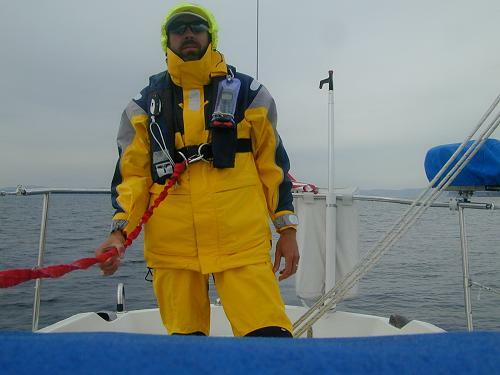 Here you can see how I tie to the buoy with my snubber line then attach that to my anchor bridle. 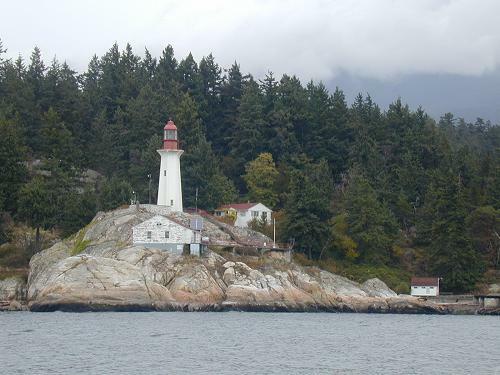 When I crossed Haro Strait to Stuart Island I was back in the USA. 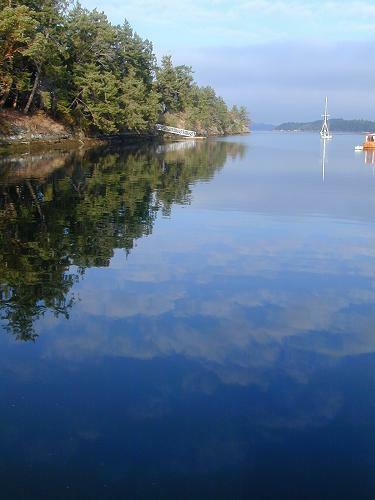 I sailed in squall conditions to Roche Harbor then went through customs by video phone. It was all very easy and I quickly proceeded to my slip. That afternoon Karen, Steve, and Jane arrived from Seattle by floatplane for a quick weekend - my last visitors. 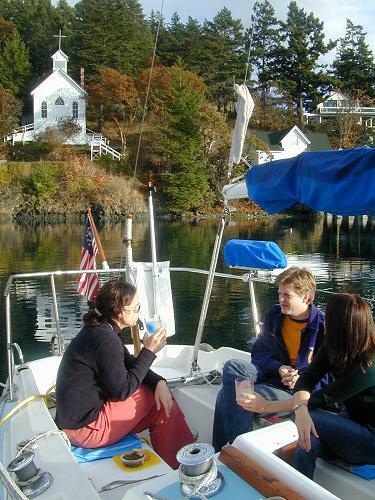 Here we are enjoying happy hour in the setting sun under the Our Lady of Good Voyage chapel. We had a good time - stopping one night at Jones Island before they flew home Sunday from Rosario Resort. The final journey back to Seattle was quite the adventure. After an uneventful motor across the Strait of Juan de Fuca in calm winds, I met up with my friends Todd and Heidi in Port Townsend. We went back to their cabin in the woods for an evening of fun and I spent my first night ashore in 6 weeks. 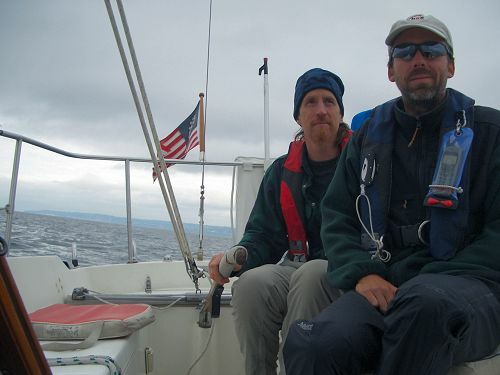 The next day Todd and I sailed south to Kingston in 20 knot winds and heavy seas. Crossing the tide rips in Admiralty Inlet in a wind against tide situation is not an experience I wish to repeat. We had big boxy seas coming from all direction and Gata Luna got pounded about with water over the bow and splashing down below. We eventually got to Kingston wet, exhausted, and ready for a beer and dinner with Karen who had traveled there to meet us. The next morning we woke to calmer weather and made the easy passage over to Shilshole, the Ballard Locks, and finally back to our berth in Fremont. It was a grand adventure and we are now seriously interested in doing this again for a longer period of time. But this next time Karen will be aboard full time.